Q: “Push-Pull” connectors have been a growing presence in military markets, what are the advantages? A: “Push–Pull” connectors have been in the field for over 50 years and used in every harsh environment application. They are rugged, sealed, can withstand thousands of mating cycles and have a high number of contacts in a small, compact package. Over the past 15 years or so the military has recognised their performance and how they fit well with where the future of military equipment is going. 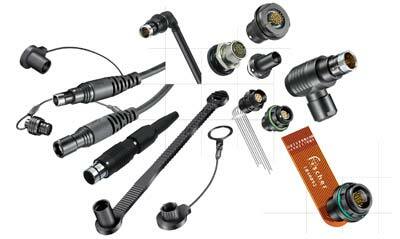 There are a number of key features to the connectors that are attractive to the military soldier. The “push pull” feature is designed for quick, one-handed disconnect. This allows the soldier more versatility in the battlefield and more assurance that they will be able to rapidly connect and disconnect equipment under duress. There is no twisting motion, and the push-pull action is easier if conditions are cold, wet, or slippery. In addition, Fischer’s push-pull connectors have a unique 360 degree locking mechanism that is highly reliable. It is designed so that the harder the attached cable is pulled, the more the connector locks. A soldier relies heavily on the function of their equipment in life threatening situations and having the assurance that a weapon or other piece of equipment will stay connected even if a cable catches an object, is comforting. Or in the case of a helmet mounted system we also offer a Clic-Loc™ connector that will lock, but will release with a nominal amount of force. Q: Do Fischer Connectors meet the standards for MIL-Specs? A: As mentioned above, push-pull connectors were adopted by the military because of their performance in commercial applications that were similar to those that the military requires. With the rapid advancement of technology, and the demand to introduce those technologies to the military, the military was forced to look beyond military specific components that had been in place for years and had not changed. Fischer has tested our connectors in similar ways to MIL standards. We offer a cross reference table on our website (www.fischerconnectors.com/mil-specs) which compares IEC standards to MIL-Specs. Our connectors are available, sealed to IP68 (2M/24H) or even hermetic level if necessary. They carry 360° of EMC shielding and are rated to 5,000 mating cycles operating within a temperature range of -50°C to +150°C. Q: Soldier Modernisation Programmes (SMP’s) illustrate the transition from centralised use of large electronic equipment to the use of much smaller equipment by each soldier. What kinds of connectors have been developed to meet this trend? A: No doubt the trend towards portable electronics is increasing in the military market just as it is in the commercial market. In soldier modernisation programmes, the drive has been to smaller and lighter as the soldiers are carrying the equipment. Using the same, reliable push-pull model, Fischer created two variations of our standard product - our low profile connector series and our new AluLite™ Series. Q: What is different about the low profile and AluLite™ connectors? A: Both product lines focus on size and weight reduction. For the new AluLite™ series, we introduced a special weather resistant aluminium alloy while still maintaining the high levels of sealing and durability. Using the aluminium alloy also made it possible to offer the connectors in different colours including green, beige and flat black. The low profile connectors were developed by changing the body styles of the existing product line and making them smaller and more compact. To maximise this effort we implemented a “full solution” strategy to meet customer needs. As the cables in any soldier system are as important as the connector, Fischer took into consideration the types of cables being used in these harsh environments. Then we went to work on designing the plug connector to make the best use of space and size and still provide a high performance connection. Q: What are the key benefits to a “full solution” approach? A: As we are the experts of our connectors, we should also be the experts in attaching cables to them. For some time now Fischer has been offering overmoulded assemblies, using specially designed cable and proprietary potting techniques that maximises the performance of both the cable and the plug connector. We have overmould tools for all our plug sizes. The customer receives a rugged, IP68 sealed assembly with a high strength strain relief for a better price than assembling it themselves or through a subcontractor. As an added benefit, the overmoulded assembly is a more attractive design than a simple heat shrink boot. We also offer standard flex assemblies for the receptacle side (typically on the equipment) of the equation as well. The customers benefit from efficiency with a reduced supplier base, a reduced lead time and have one supplier for any technical or quality issues. Q: What kind of equipment is utilising Fischer connectors? A: Fischer is being utilised in almost all aspects of the soldier system. 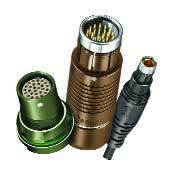 Fischer connectors can be found on CPU’s, radios, battery packs, and helmet and weapon mounted systems. Beyond the soldier system we are also involved in security and surveillance systems, unmanned vehicles, simulated training equipment, and anything else that requires connectors that can withstand harsh environments. Q: Can you outline your level of participation in recent SMP’s? A: We are involved in most US, European, and Asian soldier modernisation programmes through the main contractors supplying equipments for C4ISTAR capabilities. Programmes include, but are not limited to, Land Warrior, Future Force Warrior, FIST, Bowman, and FELIN. Q: What are your criteria for success in the defence and security market? A: In a word – safety. Safety for the soldiers through reliability, durability, and quality; safety through ease of use; safety through responding to the needs brought back from the battlefield. If a level of comfort is realised, or a life is saved because our connector has done its job, then we have had some level of success. Other levels of success are measured by our own internal company operations. Serving the defence and security market is a challenging and demanding task. Without our state of the art Material Requirements Planning (MRP) and manufacturing systems it would be near impossible to respond to the fluctuating demands in the current economic climate. Failure to deliver is not an option and it must be just in time or not at all. Q: What trends do you see on the horizon for the military connector market? A: The primary challenge is the need for more bandwidth. The ability to send large amounts of data, HD video and pictures, etc…, from the battlefield back through the support network will push the limits of connector design. This demand will likely involve hybrid connectors that will support fibre, power and signal contacts that can operate under extreme conditions. Trying to harness the speed of technology is a near impossible mission, but we look forward to the challenge! Q: Why visit the booth at Soldier Technology UK - London July 1-2, 2009?